In similar habitats as the closely related Juncus effusus: marshes, shores, banks of ditches and streams, bog borders, pastures, etc., but perhaps less common. 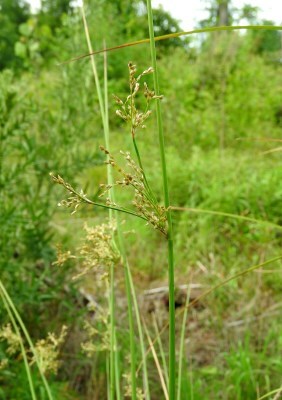 Often a smaller plant than Juncus effusus, but with tepals often longer than those of J. effusus, the larger being 2.5–3.8 mm long and consistently longer than the capsules at maturity. MICHIGAN FLORA ONLINE. A. A. Reznicek, E. G. Voss, & B. S. Walters. February 2011. University of Michigan. Web. April 21, 2019. https://michiganflora.net/species.aspx?id=2913.